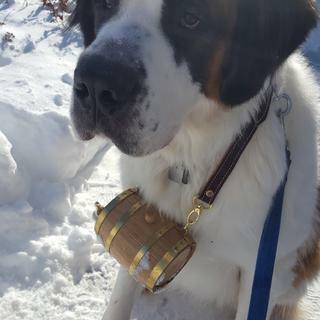 This St. Bernard barrel collar is the perfect accessory for your dog! 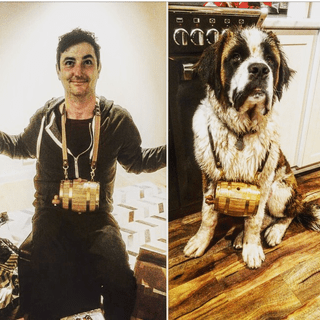 Legends dating back to the early 1800s say that Saint Bernard rescue dogs would carry small kegs on their collars when they went off to rescue lost travelers. The spirits inside would help to rejuvenate the weak and weary travelers for their journey home. Today, the legend lives on and the St. Bernard barrel is just as popular as ever! These durable collars feature an authentic oak aging barrel with the band style of your choice. The barrel is functioning and complete with a spigot but we suggest you leave it empty, for the dog’s sake. The collar and barrel are beautiful and very high quality. I give it four stars because I was expecting a turnkey product. There is a slightly involved process in preparing the barrel for actual liquid storage that is not mentioned in the item's description. I bought the 1/2 L barrel and like the size to keep it from being overly large. I have a 105 # St Bernard and it fits her well. As others have mentioned there is a bit of work in preparing the barrel but nothing very difficult. The only real complaint and where a star is missing is that the leather strap is freakishly long. On it's shortest setting the barrel hangs down at my dog's knees and she can drop her head and the whole thing falls off. I plan on taking it to the leather shop here in town to have it modified. It truly is the real deal! Love it. Very pleased with the keg. Looks great and holds plenty whisky. Exactly what I was looking for! Dude is still to grow into his Keg but the birthday boy is loving it. Excellent quality for this St. Bernard barrel collar. Just what our boy Bowe needed to look strong and handsome like the champion he is. Bowe looks handsome wearing his barrel collar on Christmas Day 2018. Had a problem with my first barrel. Called new one sent out straight away. Great Customer Care! 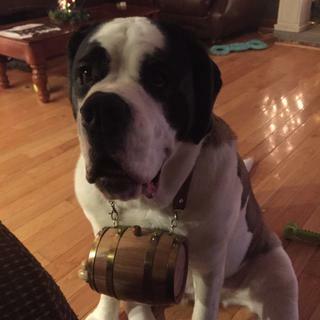 Perfect brandy keg for my Saint Bernard! 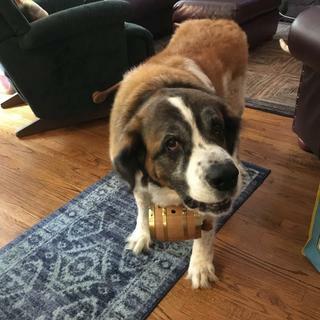 I recently adopted a senior Saint Bernard, and wanted to get her a brandy keg. I was so happy to find exactly what I needed at Kegworks! I have the half liter keg seasoning now but plan to put either wine or whisky in it. It is the perfect size for my dog and the collar fits her pretty well, though I might add an additional hole on each side to keep it from hanging too low when she wears it. Lady is now a proper Saint Bernard! NICE QUALITY PRODUCT. WOULD RECOMMEND. I WOULD RECOMMEND THIS PRODUCT. IT IS OF HIGH QUALITY AND CRAFTSMANSHIP. I DID NEED TO MAKE THE COLLAR SMALLER. 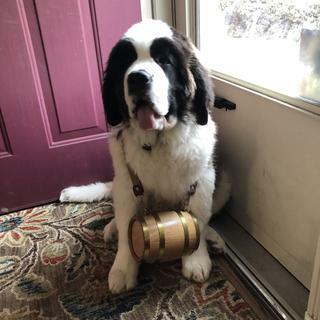 We ordered this barrel for our St Bernard. We love it and it exceeded our expectations. 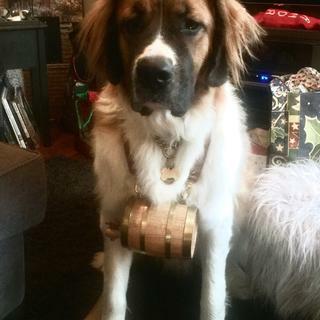 Meeka, our St Bernard loves wearing the barrel. Thank you for taking the time to leave a review, Colleen! We love to see our products in use and Meeka looks adorable! Was awesome for our Saints! Like everyone says, the strap is too long! Otherwise Its nice quality, and looks great. We went with the half liter, as our Saint isn't a beast. My only complaint is that the collar could be easier to make smaller. My Bernese Mt dog isn’t quite big enough for the smallest adjustment. But the keg itself is nice oak construction., nicely finished. I must say that I am a little disappointed in the craftsmanship of the product. The item doesn’t have clean lines. You can see & feel the unevenness. How heavy is the 1/2 liter barrel? Is it light enough for a dog to wear it comfortably? My St Bernard wears it and doesn't notice. She loves bringing me liquor. It is her favorite game. We don't put it on nearly enough. I would not recommend it for smaller dogs though because it does feel heavy. It's plenty light enough for a st bernard, even when full of brandy. It would help if the straps were shorter so it would not bang the front legs. Hi Dianne, the half liter barrel weighs about 1 pound. It would definitely be light enough for a large dog to carry. Cheers! I don't know what it weighs. Mine went of a 200 pound Saint who wears it comfortably. I have a king charles cavelier, would the 1/2 liter be too big for him? Thanks for your question! The standard 1/2 liter collar will probably be too big for your breed. A better option for you may be our Personalized Mini Barrel Collar. I've attached a link for you below. The collar will definitely be too big. I have a female Bernese and had to physically shorten the collar by cutting and re-riveting it. The keg size will be fine, the dog will just have to get used to it. Yes, I believe it would be, unfortunately. I bought the 1/2 liter for my basset hound (yup) and ended up giving it to my friend to use with his Bernese Mountain Dog, because it was too big for my dog. Yes, it was too big for our 22 month old St. Bernard. It's for an adult giant breed. I also have a King Charles Cavelier. This collar would be way too big for him! This is a really nice barrel but I think it would be too big (heavy too). Yes, it would be too big for a dog that size. What size barrel do I need for a 150# st.bernard? BEST ANSWER: Hello. There is no set barrel size recommendation based on the size of the dog as it really comes down to preference. The dimensions for the Half Liter Collar Dimensions are 4"W x 5 1/4"H x 4"D, while the dimensions for the 1L Collar are 4 1/2"W x 6 1/2"H x 4 1/2"D. So I would recommend just sketching out each set of dimensions on paper and hold them up to your dog to see how they each look, then pick the best one that suites you. When I purchased the St. Bernard collar I believe there was only one standard size and I believe it was specific to st. Bernard's. I got one for for a large Labradoodle and the barrel was great, if filled it would be too heavy for her, the collar was big. I had to modify it quite a bit to fit her. Hope that is helpful. 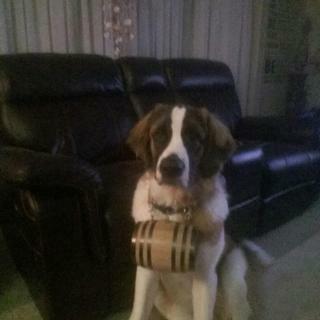 I purchased a 1 liter barrel for our 135lb St. Bernard and the barrel is a great size for him. I did have to cut and adjust the straps for it to fit him. We purchased the 1/2 liter size and it was perfect for our 165# St Bernard. Quality is excellent. I think it was the 1 litre, but i will have to check. I had to shorten neck strap was too long. i bought the large one 165 pound dog!! Can I put liquid in this? BEST ANSWER: Yes I did, you'll need to put water in a day before to allow for the wood to swell and seal off. Depending on the frequency of use, you'll have to continue putting water in the night before use to prevent leaks. I didn't put liquid but I'm pretty sure you can do it. The wood barrel looks exactly as a real wood barrel in all aspects. Yes. If you follow the directions included by filling with hot water and allowing the wood to swell it will hold liquid. My saint has a 26 inch neck. Will the collar fit his neck? BEST ANSWER: Although I did not measure the neck the barrels have a long adjustable leather collar and surely will fit the largest of dogs. These are made specifically for the breed and are made of real materials to add to their charm. I believe so. I put the Barrel on my Lab and had to get hardware to make the collar smaller. I hope this helps. My saint is huge and if anything the collar is too long. Adjustable straps do help. Can you make the barrel into a chest easily? Also would the small barrel fit a ring box? Well, interesting question! I'm not a wood working type person, I imagine if you are proficient in that area, and know how to finish wood and the brass rings that surround the little barrel, it might be possible. It seems like a lot of work, however. And yes, the barrel is big enough for a ring box...might I add my congratulations?? You may, thank you I am just starting the planning. I will be getting this and working on it. 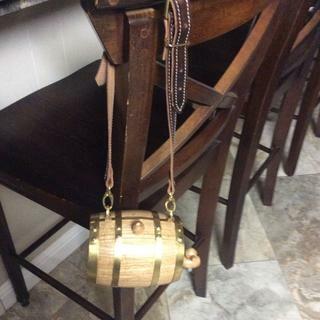 Yes, I have a smaller keg that my dog wore around his neck in a Dog Parade, and a ring box would fit in the keg, however I don't know exactly you could get the ring box inside of the keg ~ the wooden keg seems to be sealed. You would need to cut open one end it if you can... Good luck. You have a GREAT idea if it's for what I think it is! I would love to see the finished "chest" and perhaps a picture of the presentation, if possible...I'm an old romantic at heart! Good Luck! I asked my son about this and he said you could make it into a chest. I believe it would hold a ring box just fine. I am planning on proposing to my girlfriend and I want my dog to bring it to her. So I would like to find a way to or a different product to place a ring box into the barrel. The barrel is solid! I would suggest you get a hunting dogs bell assembly and substitute the ring for the bell! Hello, how large is the opening? We would like to put our wedding rings in it and have our swissy be the ring bearer. Do you think a ring (no box) would fit through the hole? BEST ANSWER: Aw that would be really neat - I wish I could answer the question but the keg collar was a gift for a friend. I did not inspect it that closely. However I can tell you the quality was excellent and the friend called after receipt saying they were excited - it was exactly what they had been looking for. Not at all. The opening is large enough for a small funnel to fit in, definitely too small for a ring. Def not, unless they are tiny rings or if you make the hole bigger. No. They will definitely not fit. My saint is a 9 1/2 mo. old male, 115lbs now. Should I get the half or full liter? size from an aesthetic and functional stand point. Hope this helps. I have a female full grown at 7 years and 140lb. the full liter is fine for her. there isnt alot of difference in size. I would go with the larger one but you will have to modify the collar as it is way too big. Thank you! I'll go with the larger one for sure. I got the smaller wood barrel for my 144# St. bernard and it looks tiny. I got the full for my 105 lb. Bernese Mtn. Dog and it is perfect. 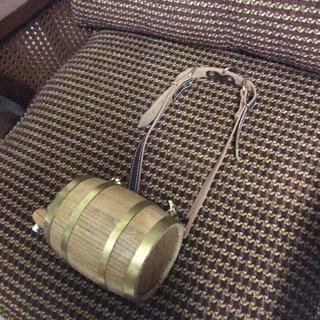 Is the collar attached to the barrel made of leather? Yes, the collar is made of leather. Is this safe to put liquor inside? My St Bernard wears his with brandy on all our winter outings..
What would be the proper size for a Husky? BEST ANSWER: It really depends on the size of your dog and how you want it to look. To help your decision, here are the dimensions for the two sizes. Can I customize with my dogs name on it? BEST ANSWER: We do not offer personalization on this item through our site. However, you may be able to find someone locally in your area who can either engrave a name plate or etch the name directly on the barrel. We do offer a smaller, personalized dog collar barrel style. I've attached that here for reference. Cheers! Hi..theres is room on the sides..the barrel has a curved shape so it depends on what you are planning to use..a name plate with engraved name would work because it is bendable..
Hi wondering if you will be getting any more barrels for the st Bernard’s? BEST ANSWER: Yes, we will be getting more in stock. We are expecting to have them back in by the end of the month. You can sign up to receive a notification when they are back in stock right from the product page. Cheers! Hello-Can you customize the barrel and harness in pink? 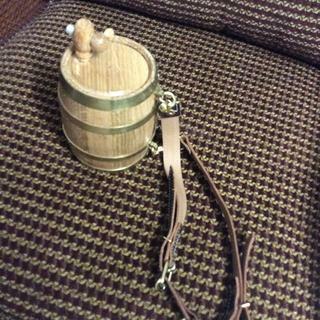 BEST ANSWER: Unfortunately, this barrel cannot be customized and the harness is only available in the color shown. Do you make one that would work on a American Bulldog? BEST ANSWER: Hi Michael, Our personalized collar is a mini version that's perfect for smaller dogs! It's about 2.5" wide. You might need to adjust the collar to get a good fit. Cheers! Can you just buy the collar? BEST ANSWER: Hi Kathleen, I'm sorry but we do not sell the collar separately.